These ingenious, triangular shaped crayons won't roll away. Made of plastic, not wax, for additional durability, this set of 24-rainbow color, non-toxic crayons stay on the table- just where your little artist put them! They pack into their own sturdy, plastic flip-top case for easy clean up. The unique shape will help develop the preferred grip for later writing skills.Dimensions: 6.55" x 7.5" x 0.75" Recommended Ages: 3+ years. We received these crayons with our Seton pre-k enrollment 2 years ago. Love them and are still using them. 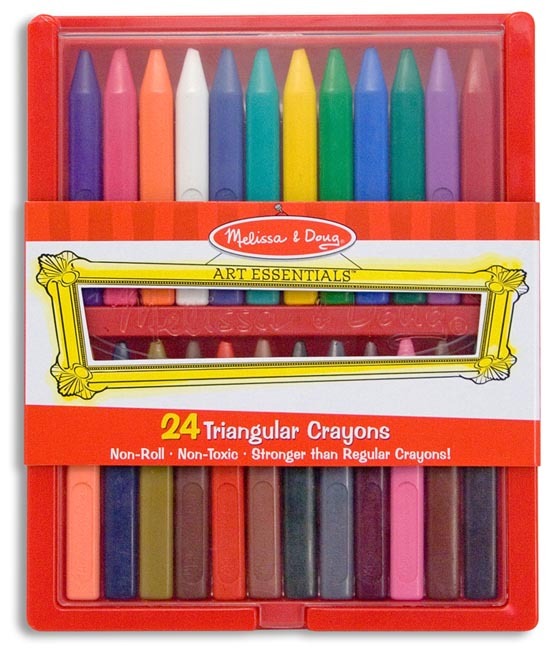 These crayons last much longer than typical crayons and go far longer without breaking. I think the material for these crayons is more durable than the wax crayolas. Also, the triangular shape means they are not rolling off the table and breaking, and the plastic case makes it easy for the kids to put the crayons away.